Republican Rep. Tom Cotton announces bid to challenge Sen. Mark Pryor, D-Ark. Conservative freshman Rep. Tom Cotton, R-Ark., on Tuesday officially threw his hat in the ring for the Senate seat currently occupied by Sen. Mark Pryor, D-Ark., one of the Republicans' most coveted Senate seats of the 2014 election. 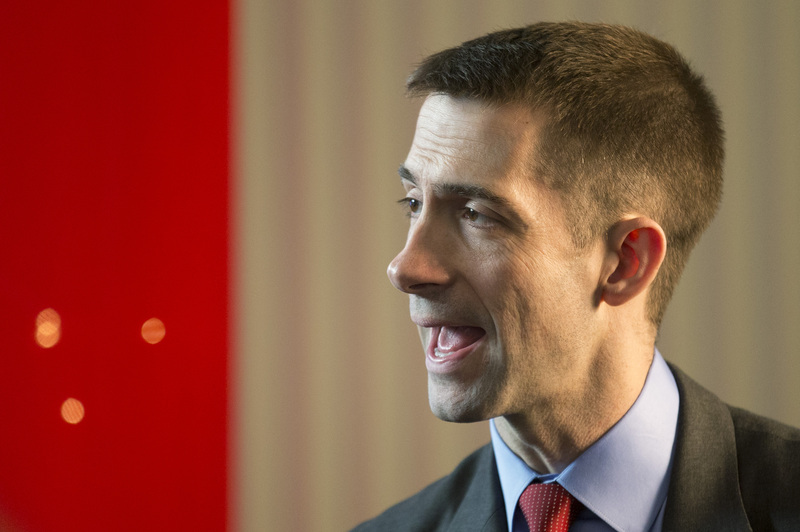 "Politicians in Washington boss you around and act like they're better than you," Cotton said during his announcement speech at the Dardanelle, Ark. Community Center. "Some say I haven't been in Washington long enough... but I've been there long enough to know that Washington needs to change." Democrats currently have a 54-seat majority in the Senate, but with a handful of Democrats on the defensive in heavily Republican states -- like Pryor in Arkansas -- the GOP has the opportunity to win it back. With the expectation that Cotton would enter the race, conservative groups have been backing him for months now. As CBS News' Elections Director Anthony Salvanto points out, that means he won't have to risk running to the far-right and alienating general election voters. A pair of partisan polls out this week suggest the race will be tough for Pryor, in spite of his incumbent advantage. In one poll conducted for the pro-Democratic union AFSCME, the Democratic senator has an eight-point lead but only has the support of 43 percent of voters. A conservative poll, meanwhile, gave Pryor just a two-point lead, leaving him and Cotton statistically tied. Now that Cotton is officially in the race, Pryor is hitting him hard: The senator released an ad Tuesday slamming Cotton for his congressional record so far and released a video statement where he attacks Cotton's record himself. "I don't know who Mr. Cotton's been voting for, but it hasn't been Arkansas," Pryor says in the video. "When you vote against student loans and against the farm bill and you vote to cut Medicare and Social Security, you're not voting for Arkansas, you're carrying someone else's water." Pryor may be alluding to the support Cotton has from conservative groups like Club for Growth, which has been attacking Pryor as "Barack Obama's best ally in Arkansas" for months. Cotton, who has two Harvard degrees and served in Iraq and Afghanistan with the U.S. Army, was elected in 2012 to represent Arkansas' fourth district with financial help from the Club. It turns out, Pryor is not only battling Cotton and the GOP but he's also been taking heat for his pro-gun views from national gun control supporters. Mayors Against Illegal Guns, the group organized by New York City Mayor Michael Bloomberg, has targeted Pryor with activists and TV ads, hammering him for opposing the Senate's failed effort to tighten gun laws. In a May ad defending his Senate vote and reminding pro-gun Arkansans that he's not in lockstep with national Democrats, Pryor said, "No one from New York or Washington tells me what to do. I listen to Arkansas."